Silver futures should be back on the radar for bullish investors this week because of fundamental and technical factors. Nothing is certain at this time, and any rally is still highly speculative, but if everything lines up this week, we could see the start of a short-term rally that could develop into a longer-term move if the rally is supported by a change in the fundamentals and on rising volume. Since July 5, December Comex Silver futures have broken sharply from $21.25 to $18.55. The top was reached early in July following a buying frenzy that lasted two weeks. The initial trigger of the price surge from $17.67 is being attributed to the surprise decision in late June by U.K. investors to leave the European Union. At that time, chaos and uncertainty gripped the financial markets with global equity markets plunging and demand for protective assets surging. Investors sold-off stocks and parked their money in hard assets such as gold and silver. Seizing on the major shift in momentum, hedge funds and Chinese investors bought silver aggressively. Speculative positions held by these investors reached record levels while demand for exchange-traded products continued to rise on an almost daily basis. Silver prices rose to multi-year highs on huge volumes. However, this all came to an end on July 5 when the market hit $21.25. Open interest in the silver contract began to decline, but volume continued to remain strong. This indicated that longs were liquidating their positions. The selling pressure continued throughout the month as speculators increased their bets that the Fed would raise interest rates in either September or December. After consolidating for six weeks, silver began this week with a spike to the downside. The spike to the downside and the subsequent rally on August 22 suggests that short-sellers may have seen enough. However, we won’t know until Friday after Fed Chair Janet Yellen delivers a speech at the Jackson Hole, Wyoming symposium for central bankers. Yellen may confirm that a rate hike is coming before the end of the year, or she may drop hints that a rate hike may be pushed into 2017. Technically, the main trend is up according to the weekly swing chart. The seven week break from the top was only a shift in upside momentum and not a change in the trend. It occurred because prices had advanced too rapidly and had to come back to a value area because shrewd investors were unwilling to chase prices higher and speculative traders ran out of reasons to continue to buy once the Brexit worries blew over. The main range is $15.97 to $21.25. Its retracement zone is $18.61 to $17.99. This zone is the first downside target and key value zone. Silver is also down 7 weeks from the top which puts it in the window of time for a potentially bullish closing price reversal bottom. Essentially, we’re looking for December Comex Silver to establish a support base over the next three weeks inside the value zone at $18.61 to $17.99. 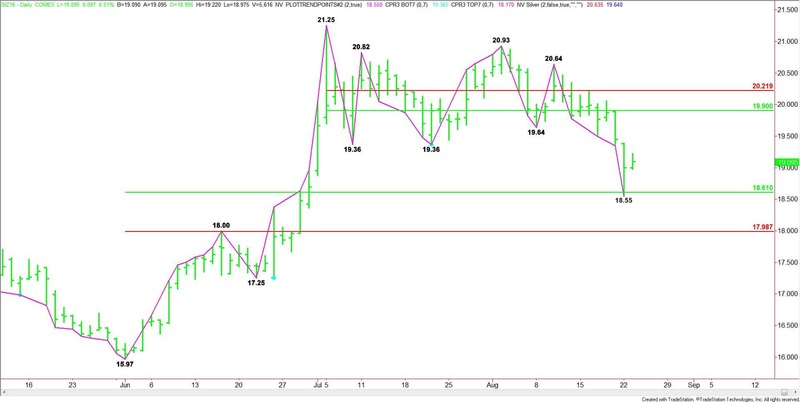 On Monday, August 22, silver found support on the 50% level at $18.61, reaching a low at $18.55. So it is possible that we may be seeing the bottoming action already. A close over $19.45 on Friday will put silver higher for the week. This will form a closing price reversal bottom that could lead to the start of at least a 2 to 3 week rally. To summarize, we’re looking for buyers to show up on a test of $18.61 to $17.99. 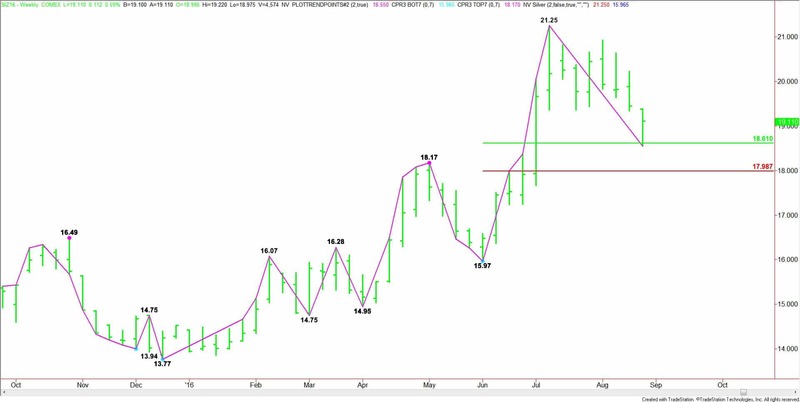 If the silver investors can establish a support base inside this zone and Fed Chair Janet Yellen delivers a dovish speech on Friday that investors determine to mean the Fed is unlikely to raise rates this year, then silver should start a strong rally. If the zone fails as support on hawkish comments from Yellen then silver prices may have to head lower in order to become attractive to buyers once again.